We have bulk ticket, standard charter and several specialty charter products available for your group. Please click on the tabs below for more information and to see which might be the best fit for you. Also, please scroll down to view our charter terms, including refund and weather policies. Basic charter customers receive exclusive use of one boat for one hour. Additional boats and hours may of course be booked at the base charter rate x boats x hours. Currently, all-inclusive (prices include tax and driver gratuity). Charter hour rates $281.78 per boat, per hour. Charters are not considered booked until payment has been received. Please provide the date and time for requested trip. Unless otherwise specified, all charters depart from the landing below ACM@UCO, located at 25 E. California, Oklahoma City, OK 73104. Each boat can seat up to 40 passengers. PLEASE NOTE: PRICES LISTED ARE GOOD THROUGH JUNE 30, 2019. Please complete group/charter inquiry form below to book. We will contact you via phone or e-mail to quote your bulk purchase. Dinner or boxed lunch cruises are available only by reservation. Dinner/lunch cruises, which seat up to 20 persons, are charters that include separately-priced catering. One catering option is Bourbon Street Cafe, a canal-side restaurant that has partnered with us on many dinner cruises and has substantial experience in setting them up. PRICE: $281.78 per boat, per hour (includes tax and driver gratuity) PLEASE NOTE: MEAL NOT INCLUDED IN PRICE (booked separately). Also, please note cancellation policy and other restrictions at the bottom of this page. These prices are good through June 30, 2019. Please complete group/charter inquiry form below to book. We will contact you via phone or e-mail to quote your group outing. The in-depth history tour is a very detail oriented account of the many changes Bricktown has gone through from the Land Run of 1889 and before all the way through MAPS and today. It is $39.00 per guest with a minimum of 20 customers. Each guest receives a copy of “Bricktown” by Steve Lackmeyer (a $21.00 value), the most comprehensive book published to date on the history of the Bricktown District. Also, please note cancellation policy and other restrictions at the bottom of this page. A team building exercise like no other! 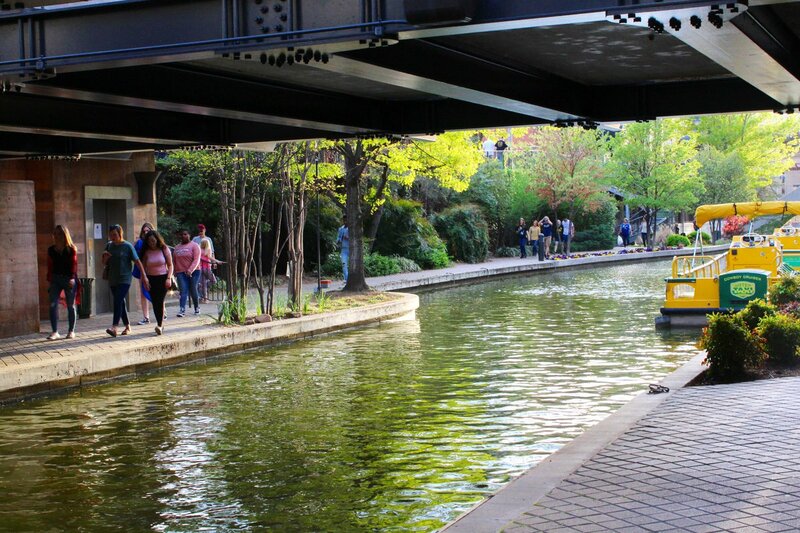 Teams compete against each other to find clues on and along the Bricktown Canal. Work your group’s theme into the clues we provide for lively competition. The event lasts for two hours and includes water, soda, clue sheets and prize ribbons. A minimum of 15 passengers per boat,and a maximum of 40. It takes at lest two boats to make it competitive and fun. PRICE: $39.00 each participant, with a MINIMUM booking of 20 passengers. Special rates are available for school, camp and daycare groups. Restrictions apply. Please submit form below or call (405) 234-8263 ext 182 for pricing and to see if your group qualifies. If you are interested in booking or receiving information on bulk sales, group tours, charters, dinner or cocktail cruises, please fill out the form below. Our team will get back with you as soon as possible to give you further details and/or to book your group visit. If this request is made after normal office hours or on the weekend, we will do our best to respond to you by the next business day. Charters are not considered booked until payment has been received. Please provide the date and time for requested trip. Unless otherwise specified, all charters depart from the landing below ACM@UCO, located at 25 E. California, Oklahoma City, OK 73104. There will be a full refund up to seven (7) days prior to charter. No refunds within seven days of event except for bad weather, such as heavy rain, winds over 40 mph sustained or extreme lightning. Temperatures exceeding 100 degrees F are to be expected during the summertime in Oklahoma City and are not a valid reason for cancellation. Water Taxi is currently in our weather-dependent off-season. Until March 1, we will only be open limited hours during exceptional weather. To see expected schedule and fares, please click below on the date of your desired visit. It turned out to be a beautiful day here in @_Bricktown. 🙌 Weather permitting, we’ll be cruising the canal until 9PM tonight and 11AM - 9PM tomorrow. As expected, @OKCStreetcar ridership spiked dramatically in March as temps rose & riders got used to the fare system. From Feb to March, ridership jumped 62%. Over 33,000 riders used the Streetcar in March. April is already looking even better. Keep enjoying the Streetcar, OKC! Copyright © 1999-2019 Water Taxi, LLC. All rights reserved.